Finding a home on consoles is an ongoing challenge for games that have seen success on Steam and smart devices. While free-to-play or relatively inexpensive titles are becoming available on digital marketplaces thick and fast, it could be argued that there is a degree of stigma that comes with titles making the shift from mobile to console. There are some genuinely great releases and a select few have transferred well over to the console space, including the Switch eShop. While this 'gold rush' of titles on the Switch can reveal some hidden gems, it also runs the risk of being a victim of its own success. 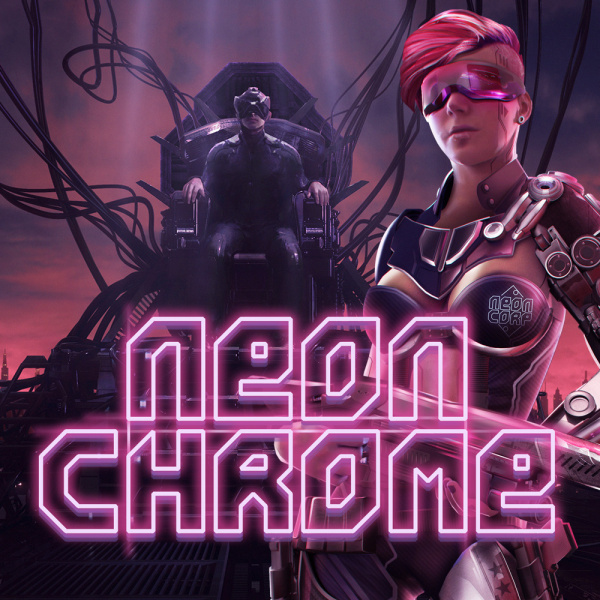 Neon Chrome arrives on Switch as a stylish top-down, twin-stick and rogue-lite shooter, with the backdrop of a moody cyberpunk dystopia; the central plot is a combination of Thomas Anderson, Rick Deckard and John Mclain's worst 'bad day at the office'. You take up the role of a hacker whose mission it is to infiltrate the giant titular tower block known as Neon Chrome, and free the city by remotely taking down its ruler - the elected enigma that the building's one million enslaved inhabitants 'trust', known only as the 'Overseer'. Climbing thirty two floors in any given 'neural link', the end goal is to reach the top and face off with said nemesis. 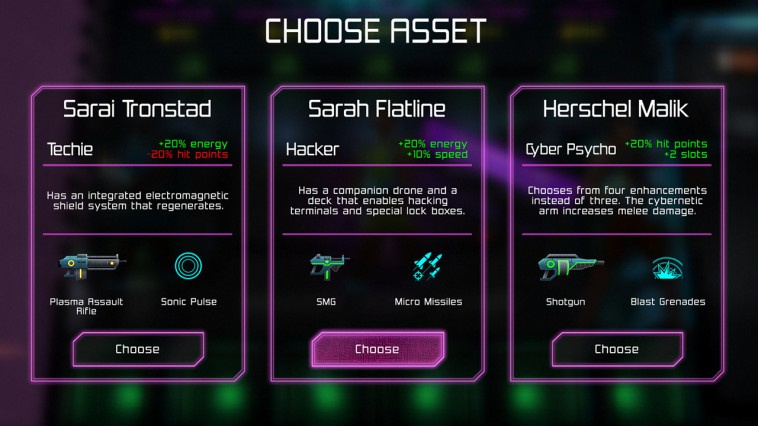 From the outset the player sits in the 'immersion chair', able to possess one of three possible, randomly generated avatars referred to as 'assets' - representations of human inhabitants that have different weapon load-outs and strengths. Of course there is a local multiplayer option, so you can find a friend or three and snap off those Joy-Cons for some cooperative action. 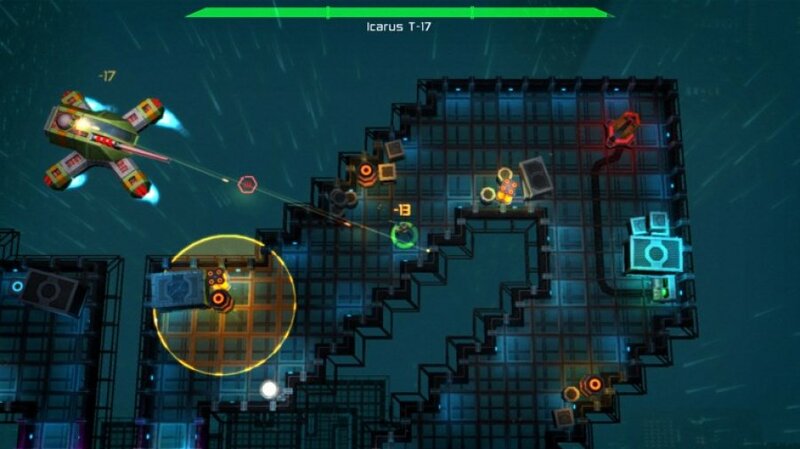 When dropped into the procedurally generated set of levels there is a mix of destructible corridor walls, drones to disable, scuttling little beasties to combat, lasers to avoid and special operatives to take of, as well as loot boxes and weapon upgrades to collect. If your avatar dies weapons and stats are retained for your next run, while cash can be traded to increase health, luck, energy or slots; there are a wealth of impressive sounding 'cybernetic enhancements' (abilities) to gather while progressing through the levels. You will die and grind a lot in the opening hour or so, but defeating a boss ensures that you at least get closer to the summit without having to start from the bottom again. Despite the evil mega corporation, themes of manipulation, control and a maniacal puppet master overlord rhetoric, the overall presentation of the game is pretty lacklustre. The opening cutscene, complete with mauve impressionist skyline and glowing signage, mostly takes care of exposition, with the selectable characters displayed as boxes of text and icons. The appropriately ominous and ambient synth soundtrack fits in well with the aesthetic, harking back to the Sci-Fi classics such as Blade Runner or Terminator. Within the levels, Neon Chrome also sets up a rich, interesting interface - you jump into chambers that are scattered around the levels, with futuristic fonts and fancy insignia for excitingly named special abilities - but the experience is diluted by actually making no real noticeable impact to the actual gameplay; the changes are stat based and don't translate well into the action. Although the levels are procedurally generated, they rarely show any drastic variety in their layout, but the structures of narrow passageways and cubicle-like spaces or rooms - full of power generators - make for some impressive explosions. In terms of extra challenge outside of the gunplay, only colour coded doors that require finding the corresponding keys or taking down particular beacons provide any kind of obstacle, so navigating each floor becomes rather predictable. Despite stealth kills, strafing around bigger enemies, the occasional chain reaction of explosions causing widespread carnage - with the ensuing lighting effects that are undeniably satisfying - and Neon Chrome's fixed top-down viewpoint doing a decent job of showing level layouts, the sprite models feel bland and so distant that the characters (only seen in the pause menu) possess very little personality or physical identity. This is especially notable in handheld mode, where the whole experience seems rather blurry compared to docked gameplay. When all is said and done, when the glow of the stylish aesthetic and the intrigue of the Cyberpunk Orwellian narrative have fizzled out, Neon Chrome emerges as an average, sometimes fun but more often than not generic twin-stick rogue-like with a Sci-Fi coat of paint; it rarely lives up to its explosive promise or explores its thematic potential in any meaningful way. It could be argued that the genre is solely about the mechanics, but with a neglected backstory failing to compliment the reasonable if hardly revolutionary gameplay, it's difficult not to feel a little flat about the experience on offer. Oh no, I picked this up at lunch time because of the STEAM user reviews. What have I done!? hmmm I will take that into consideration. @Shiryu Uh-Oh, shoulda just got the flame in the flood. @Shiryu I have it in android and it's decent I guess, but I stopped playing it so I suppose that says something. I had this on my PS4 through Plus, and I wasn't a fan. Especially for visuals in handheld mode. Well at least between that and touhou, trolls will stop whining about "bet it's gonna be 9/10"
@60frames-please : from what I've heard, nothing as steady as your funny username. I have yet to watch gameplay videos though. @SuperCharlie78 Neurovoider excellent Dan Terminus soundtrack makes the purchase a warranted one. @EricTheRed Don't worry I got that one too and will pick up "WuverBlade" when it is released at 10:00 WET. 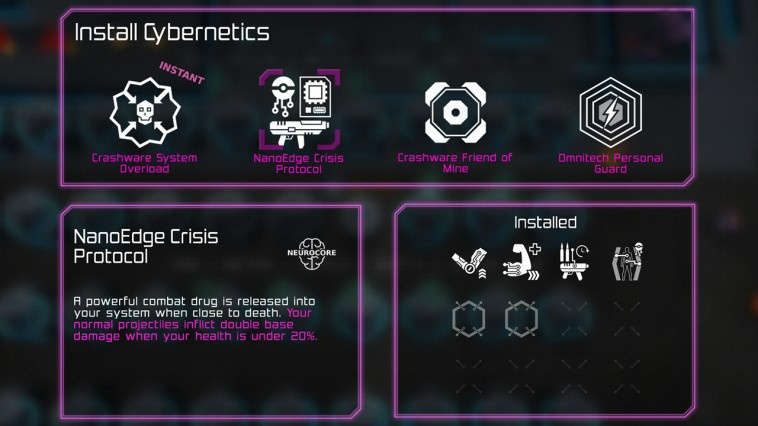 This looks like JYDGE. Hope this genre isn't becoming a cookie-cutter. @ThanosReXXX the "l" is DLC. @ThanosReXXX Loot crates. You never know what letter you might find, but keep trying... or pay to make your chances better. No, it's not gambling, honest!!! Enjoying this a lot more than Flame in the Flood. You actually feel like you aren't starting back at square one again when you die. Played this on PS4, the review is dead on. It's not bad just blah. 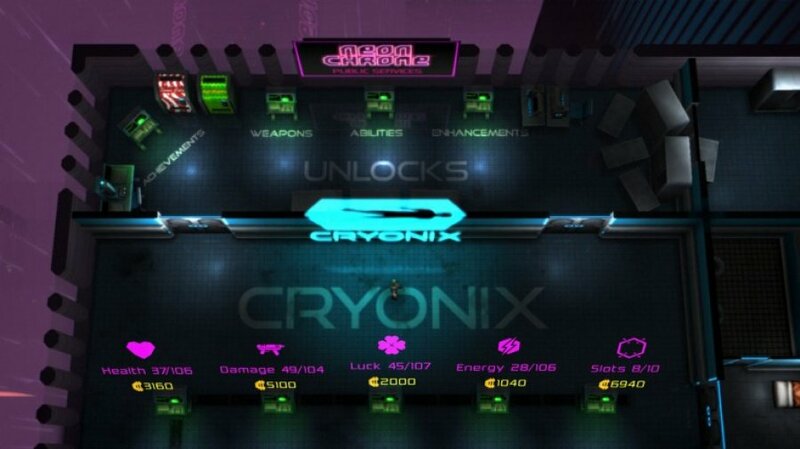 @GrailUK Jydge is made by the same company and set in the same universe, but Jydge's levels are hand-crafted. @Pahvi Oh fancy that lol! I think I'm going to wait for Jydge (omg that name is stupid!) the levels looked more varied than office desks. @Shiryu I wouldn’t worry, mate. I think it’s a great game. An 8 out of 10 all day long. I loved it on Vita and I love it again on Switch. @Switch99 I am doing it right now. Sorry looks and sounds rubbish. Don't even need that final score to make up my mind. @SLIGEACH_EIRE Have you actually played the game? @Kalmaro I like Neon Chrome a lot, but I’ll be honest, I wasn’t a fan of the mobile version. @Switch99 That's fair, I just stick at touch controls. For those of you who have Neon Chrome, how is it like in Handheld? I only ask because I was looking at some screenshots from the eshop and it seemed to strain my eyes. @Dunan I picked it up yesterday and have spent a couple hours with it so far...I've had a blast with it and I've ONLY played in handheld mode. It totally grows on you, you're awful at it at first but then as you die and upgrade it starts to click...then it gets insanely fun and addictive. The way it flows is crazy, and I think it's a great game. It's definitely not the flashiest game, but the mechanics sink their teeth in quickly and it becomes something really special. Definitely no issue with eye strain for me, and DEFINITELY leaps and bounds better than this review makes it sound. Maybe that's just my opinion but I'm super stoked on this one. Thanks, I actually own it on Steam but I wasn't quite sure how well it'd transfer to the Switch in handheld mode as that's how I mainly use it these days. @Dunan RIght on man, I'm doing the same...I have a great TV but I love playing in handheld, something just feels awesome about it. As far as Neon Chrome goes, I think all the hate is strange, it's super fun but maybe I don't think as much into it as some people do. Look rad? Check. Play well? Check. Replay value? Check. Don't see the problem, but that's just my opinion. @DEADCELL Seriously man, it's like this site and Push Square have some kind of personal beef with the devs or something lol. Probably not but still... &)@? graphics, the game is really fun and deeper than you expect. @ECMIM NL definitely gone down hill with most of its reviews...as of late. @Tate24 I'd understand if it was a downright $&/(); game but it's not, it's really good...especially if you get past that initial learning curve. I'm 'bout to play more right now lol! @Fake-E-Lee me and my friend just picked it up and really good! Love all carnage! A few points where I might want to disagree with the review: the character implants have stuff like using energy pick-ups to heal, splitting bullets into three after shooting and so on. In total, I counted about half of the first 31 enhancements to give the player what I believe to be a new ability instead of "200% more melee damage". But sure, those upgrades typically don't have a visual effect and the visuals are too toned-down. There are also special floors (challenges?) shown also in the "run map" usually with some unlockable thing to find, and I think these are fixed layouts. You can get to these by taking the "authorized personnel only" elevator from the previous floor. I agree the levels do get monotonous; I've reached only the third boss at my best, and I've seen the framerate stutter badly a few times. Plus, to be able to get a reasonable build for your character, I think you need to start from level 1. Cool game for Android, 8/10. Will buy it for Switch. Makes no sense to give this game a 5, it's really fun, not perfect but I would give it a 7 or 8. I played 15 hours and will play some more. Honestly, I never saw the NL review early on. This game I'd give a solid 8. It is still my most played indie title on Switch, and my second-most played overall with over 40 hours. It can definitely be a lot of fun. Scratches the itch that Binding of Isaac simply can't, for me (particularly because of BoI's aesthetic; I love The Behemoth/Newgrounds, but it doesn't always do it for me).